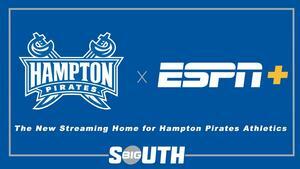 Hampton University athletics will be streamed on ESPN+ through the Big South Network. Click the button below to find out more! Hampton University athletics will be streamed on ESPN+ through the Big South Network. CLICK HERE to find out more! An email was sent to the address that you provided during checkout. There is a link at the top of this message to view the stream. If you would like for us to resend the link, please provide the email address that you used below.